The young dragons discovered an extraordinary treasure of ice: an ice column containing sparkling stones. Of course, they're all dying to take them. 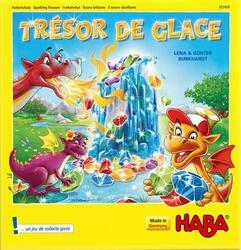 With the help of dragon dad, the players remove the frozen rings one after the other and melt the ice column. Now the sparkling stones are falling down! But be careful: they can't pick up everything. Who will have the most sparkling stones at the end of the game?